Throughout my website, you will find reviews on all sorts of different memory foam mattresses, mattress toppers and a good smattering of information pages to help you if you’re confused over various industry related “jargon”. However, during my research for the perfect mattress, I realized it’s not just adults that should have the best when it comes to getting a good night’s sleep. After all, if your child is not sleeping very well neither do you and that’s why I decided to add a review on the Sleep Master 6-Inch Smooth Top Therapeutic Memory Foam Mattress. The main reason I focus on children for this mattress is because it’s 6 inches in depth and supports children better than full grown adults. However, once you’ve finished reading this review you might just find this memory foam mattress is the perfect answer for the guest bedroom, or for those of you that prefer a shallower mattress. OK, so a lot of my reviews start with comfort, but that’s the most important thing isn’t it. 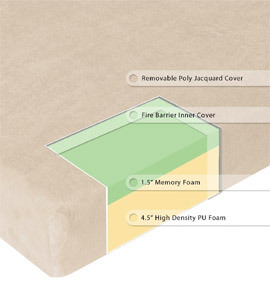 This particular memory foam mattress is made up of 4.5 inches of high density foam topped with 1.5 inches of premium memory foam. You then have an inner cover that’s fire resistant and it’s all topped off with a removable jacquard poly cover that can easily be zipped off so you can wash it (perfect for those little accidents with children). Add all of this together and you have a foam mattress that will allow you to sink in as much as 1.5 inches and the rest will contour to the shape of your body. Unlike traditional spring mattresses, the fact this one contours to the shape of the person sleeping on it allows for a more “feather like” feel as you sleep. However, this mattress does have a reputation for holding heat so it can make you feel a bit warmer than you would be on a “normal mattress”. Because of the depth, I wouldn’t recommend you use this memory foam mattress on a slat-based bed unless you’re going to use it for someone who is lightweight like a small child. If you do, the mattress may be forced through the slats overnight. This is something I’ve come across a lot during my research. Many people complain that because of the types of materials used to make memory foam mattresses, odor can be an issue. However, Sleep Master has done their best to eliminate this problem (if you don’t really care how that works, you can just skip the next two somewhat technical paragraphs..). This mattress is infused with ActivCharcol and Evergreen. The Activcharcol absorbs moisture which helps to minimize unpleasant odors as a result of sweating whilst Evergreen (a green tea extract) will neutralize everyday odors from the day you start to sleep on it. As we all know, everyone is concerned about their carbon footprint these days, and the effects that various chemicals can have on us. The manufacturer has thought about this as well. Unlike many other brands, Sleep Master has used Bio Foam which is made with natural seed oil. This reduces the need for petrol based chemical oils and it also carries the CertiPur-US certification. To help with shipping costs (and the environment) Sleep Master has used the minimum amount of packaging, so if you do decide to purchase one of these it will arrive in a very neatly packaged (and small) box. The only downside to this is you will need to leave the mattress for at least 48 hours so it can fully expand. You can also expect a limited 5 year warranty from the manufacturer, and this mattress can be purchased in several sizes. Personally, I think that if you want to make sure your children are properly supported while they sleep, have short-term guests or are someone who doesn’t want to spend a lot of money on the latest in foam memory technology this mattress is well worth a look. If you would like to find out more, take a look at Amazon (my favorite online retailer). You might be surprised at the savings you can make on the list price as well.